It’s been said that a dog really isn’t just a pet, but is rather more like a little child and a member of the family. If you’re someone who’s never had a dog of your own, I guess that might sound a bit silly to you. But, if you are now (or have ever been) a dog’s person, then I’m sure that it all makes perfect sense. I must admit, here at the outset of this story, that Toby wasn’t actually my dog. He belonged to my nieces, Jennifer and Lindsey and their parents, Mark and Donna. So, to be very precise about it, Toby wasn’t my little son – he was my little nephew and I was very proud and more than happy to be his Uncle Damon, too. I first met our little friend Toby in the summer of 1990. He was only 8 weeks old when he came to live with Mark and Donna at their home in Southern California. He sure was a cute little puppy. 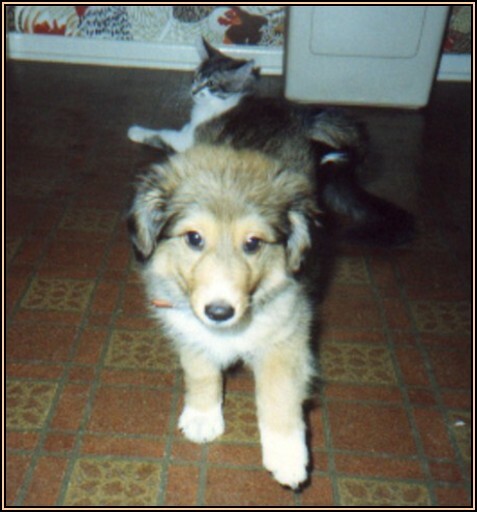 Being a Sheltie, he reminded me of a miniature “Lassie” – the famous Collie star of movies and TV in my boyhood. Now, mind you, in the summer of 1990 there was no Jennifer (she wouldn’t be born until October 1991) and there was no Lindsey (she wouldn’t be born until June 1994). So when Toby came to live with his new family, there was only Mark, Donna and he. In a way, you could say that Toby was Mark and Donna’s first child. I remember well just how joyful our little friend Toby was when Mark and Donna brought baby Jennifer home from the hospital where she’d been born. Now, I’m certainly no mind reader, but somehow I got the feeling that Toby was so happy because he now had a new sister who had come home to play with him. It took a while, of course, before Jennifer grew big enough to play with Toby. But that eventually did happen and I recall observing just how content they were when they played together. Toby was so very gentle. He never minded when she pulled his tail. He’d just turn around and lick Jennifer’s pretty little face. Then, before we all knew it, it was June 21, 1994 (the first day of summer and the longest day of the year) and we all got a brand new addition to our clan. Her name is Lindsey and I can tell you that all of us, including our little friend Toby, were both thrilled and excited to welcome her into our happy family. It didn’t take long until little Lindsey, just like her older sister Jennifer before her, grew big enough to start crawling around on the floor and playing with our beloved Toby, too. He was so delighted to now have two girls to play with. 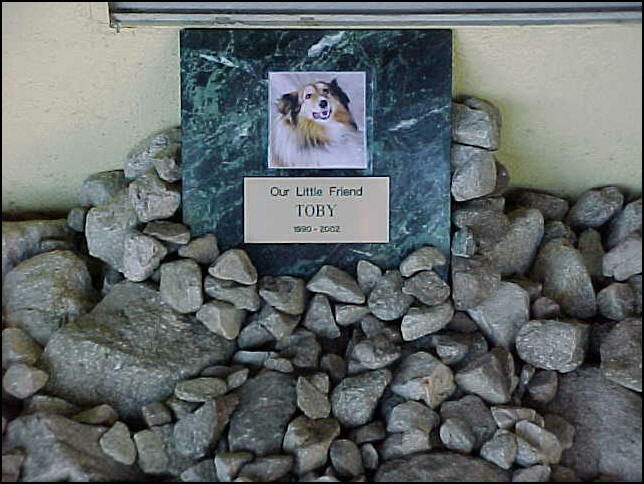 Toby loved to play, have fun and make people happy more than anything else. Time has a way of passing so fast that sometimes it seems like a blur to the memory. There were birthdays and Christmases and Thanksgivings that we all celebrated. Of course, our little friend Toby was always included in our festivities. He loved to be around lots of people… the more the merrier, it seemed to me. Jennifer and Lindsey both started going to school and, of necessity, had to leave little Toby behind. He never appeared to be sad about this. I think he knew that it was just the way that life is. But every afternoon, when the girls would get home, Toby would be there waiting to greet them with boundless affection. On June 21, 2002, we all celebrated Lindsey’s 8th birthday with a big party in the backyard, by the swimming pool. 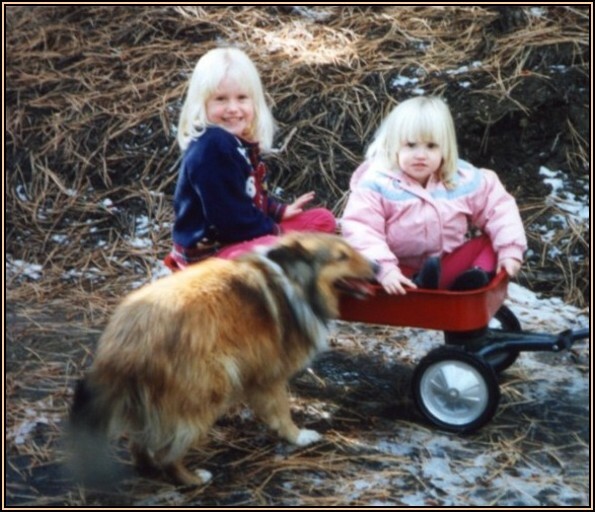 There were so many kids there as Lindsey, like Jennifer, has grown to become very popular with her schoolmates. And right there, in the midst of all that birthday mirth was our frisky little friend Toby. Yes, the first day of summer had come again. The school year was over and summer vacation was here at long last. Jennifer and Lindsey were so pleased to see summer arrive in all its glory. It meant that 4th of July fireworks were just around the corner and a family vacation was set to begin a few days after that. On Sunday morning, July 7, my telephone rang. “Hi, Uncle Damon! This is Donna.” She was calling from her cell phone. They were already in Barstow and on their way to Lake Havasu, Arizona. Donna told me that Toby hadn’t been feeling well and that she had taken him to see Dr. Mohan, his veterinarian, the day before. “I know that it’s a lot to ask,” she said, “but Toby needs to have his medicine twice a day. Can you do that for us?” Without hesitation, I agreed. If our little friend Toby was sick and needed some extra special, tender loving care, I was only too happy to oblige. After all, Toby had given us 12 years of never ending cheer. As Donna had already given Toby his medicine that morning, and as I had some other things to do, I decided to wait until early evening to drive the 13 miles to their house to give Toby his second dose of medicine. In hindsight, sadly I now wish that I had gone there much earlier in the day. When I arrived, I started jingling my keys as I approached the gate by the side of the house. Whenever I would do this, Toby would come flying around the corner from the back patio, where he liked to take his naps, and start barking a loving greeting for Uncle Damon. Only that evening, he didn’t come at all. I let myself in through the gate and walked toward the back patio. I was calling him: “Hi, Toby! Uncle Damon’s here!” But he didn’t respond as he always had before. As I rounded the corner of the house I saw him lying there, as if peacefully asleep. But I knew in an instant that our little friend Toby was gone. He had a sweet smile on his beautiful face… the kind of smile I’m sure we all display when we’re sleeping through a lovely dream. I thanked God at that moment for having bestowed upon our family the most precious of all His many gifts… a living embodiment of unconditional love who went by the name of Toby. It occurred to me then that Toby had known that it was his time to return to the world of spirit. I also believe that he knew that it would be too difficult an experience for Jennifer and Lindsey to find his lifeless little body. Although he was dying, his love for them kept him alive until they had left for their vacation. I’d like to think that Toby knew that it would be his Uncle Damon who would find him and would make sure that he was properly taken care of. This I did my best to do. I lovingly picked him up and placed him on two folding chairs out on his patio. I then sat up with him all through the night so that he wouldn’t be alone. In the morning, I placed Toby in my car and I drove him to a pet crematory where I had to say my last goodbye to this very precious soul. It was most upsetting, but I’ve vowed that I’ll try my best not to be sad. I’ll think about all the joy Toby gave everyone and feel great gratitude that his presence graced my life. The girls are still on vacation as I write this. Of course, I telephoned Mark immediately after I found Toby. But since there was really nothing they could do, I offered to tend to Toby’s last needs and he and Donna, although both saddened beyond words, decided not to tell the girls until their vacation is over this Friday. I know that Jennifer and Lindsey will be heartbroken when they hear that Toby is with us no more. It’s only natural to be overcome by grief. But their parents will try to explain that death is just a phase of life and that Toby isn’t really gone. We may not see him or touch him anymore, but he’s all around us now. On a lovely hutch that’s situated just inside the sliding glass doors to Toby’s patio, I’ve placed the little cedar casket that now contains Toby’s ashes. 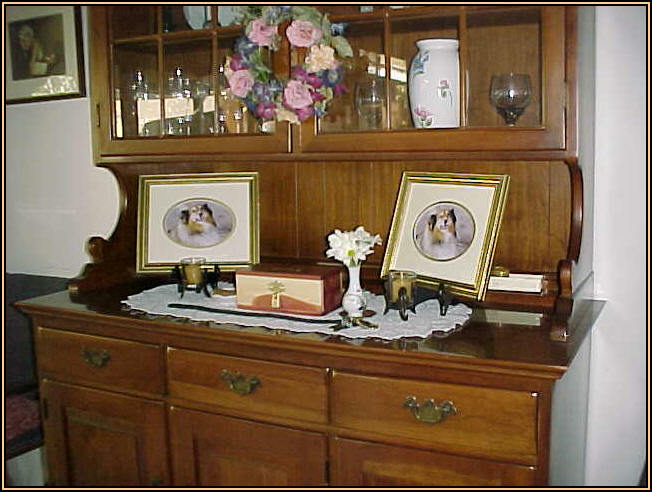 Next to it, I’ve placed his photograph (that I took at Lindsey’s 5th birthday party) and the little leather collar he wore around his neck. It’s good to have you home, Toby Boy. Yes, Toby still lives! He will live forever in the hearts of all of us who loved him and whom he loved so well. 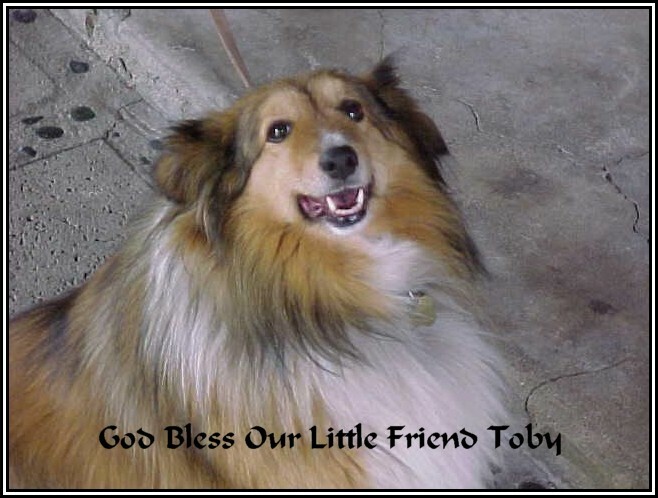 Just as he did when he dwelled in his little Sheltie body, Toby will come running whenever any of us call him. I know I’ll be calling him often. Just the thought of our little friend Toby makes me smile from ear to ear.